Checkout 51 is the best way to save money on your groceries. Total max cash back savings this week is $14. Checkout 51 is celebrating their members this week by giving one lucky member $500. Upload a grocery store receipt for $60 or more and you will be entered to win. Check out the details here. Products on the list must be purchased and receipts must be submitted between Thursday September 12-18, 2013 to be eligible for cash back. Offer quantities are limited, so please check the app before shopping and upload your receipt right away to make sure you get the ones you want! * denotes exclusive offers. These offers might not be available to you. Visit checkout51.com for more details. Cash back rebates will be available for items purchased and submitted to Checkout 51 app after and between Sept 12-18, 2013. Visit Checkout51.com to see the terms and conditions. You can download Checkout 51 app for free from Checkout51.com or from the Apple AppStore. 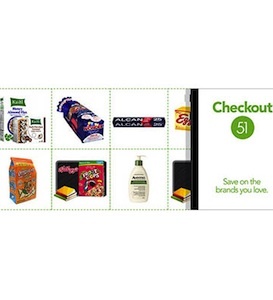 Start using Checkout 51 app to save money on groceries.